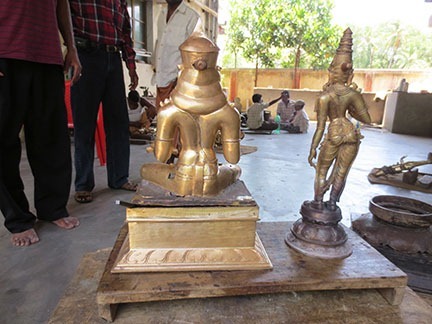 Sri Sadisvara Mandiram (Part 2); Ganesha, Subramania, Lingam, Parvati, Nandi, & Chitragupta . . . 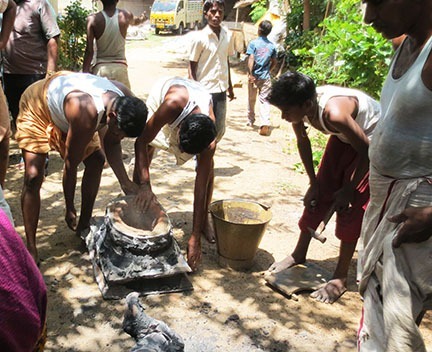 Since the conception of the Sri Sadisvara Mandiram early this year, devotees have expressed their support toward this endeavor in the form of donations. 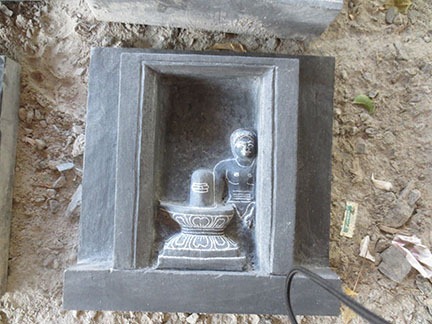 Shortly after the introduction of the Mandiram model that is located in the front entryway of the SAT Temple, enough donations were given to initiate Phase I of the Mandiram. 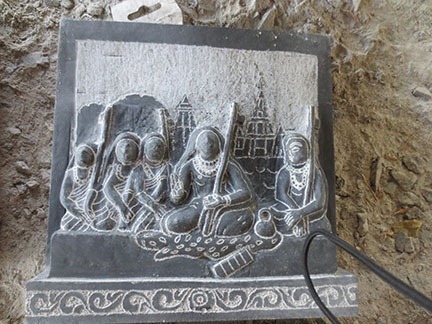 The first Phase of this holy project consists of the procurement of the above mentioned deities as well as stone tiles depicting the life of Sri Ramana, scenes of Sri Sankara’s life, and stories from the Purana-s such as Siva’s destruction of the Tripura-s, Ribhu instructing Nidagha, and Dakshinamurti enlightening disciples, to name a few. 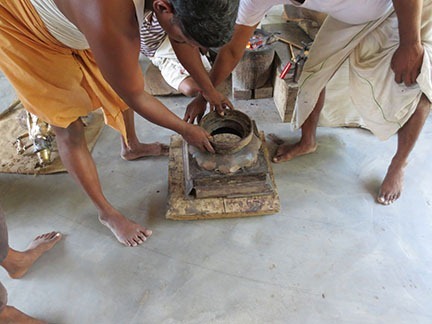 We are grateful for the efforts of Raman & Sangeeta Muthukrishnan and Sangeeta’s father, Sankar Ayer, who resides in India, for overseeing this important aspect of the Mandiram’s creation. We are delighted to share with you here the progress of this Phase. 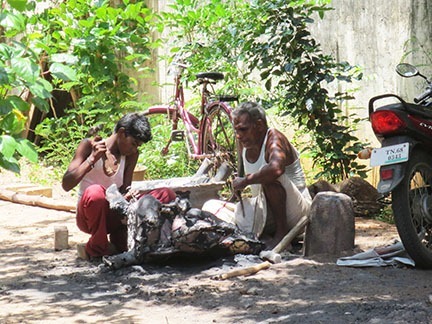 Below are images taken by Raman and Sangeeta while they were visiting India in September. 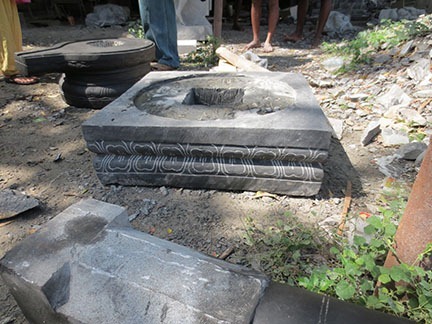 The stone Lingam above is complete and awaits shipment along with the other deities and tiles once they are completed. 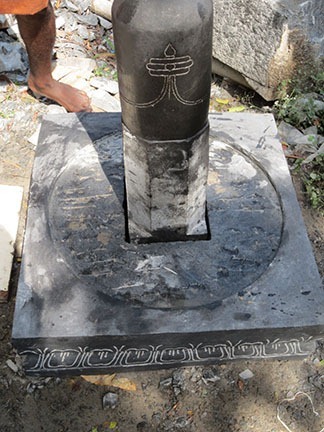 Below are images of the same Lingam showing how it is created in three parts. Below, are some of the tiles, which were mentioned above. . . 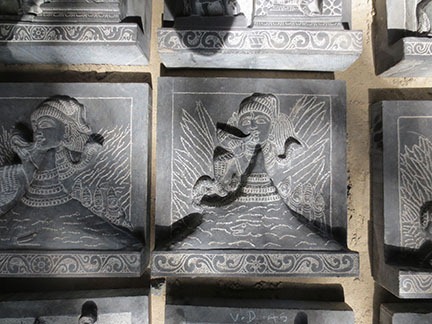 These tiles will adorn the walls and the pillars of the Mandiram. 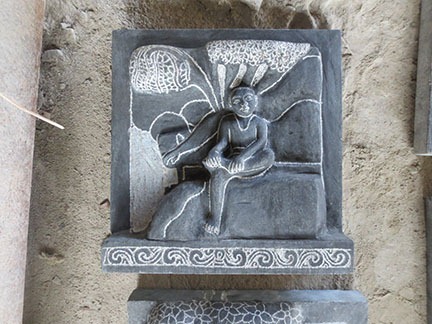 They are each bas-relief, one foot by one foot in size and approx. 2-3 inches thick. They are in different phases of completion. 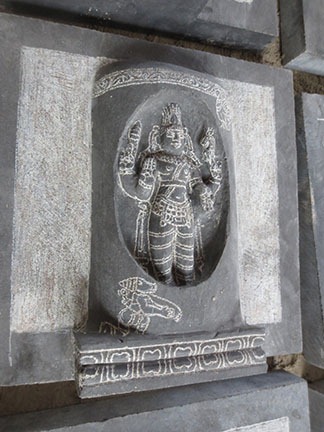 Sri Ramana approaching the temple gate at Arunachalesvara Temple. (In progress.) A faint red drawing of Ramana is barely visible against the temple tower. Sri Sankara with His disciples. 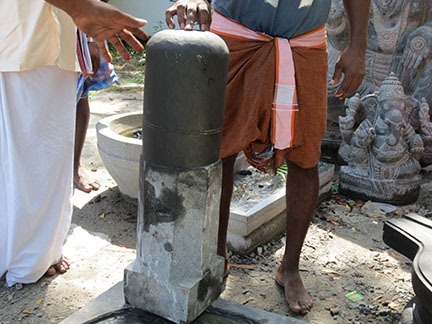 Siva swallowing hala hala poison. 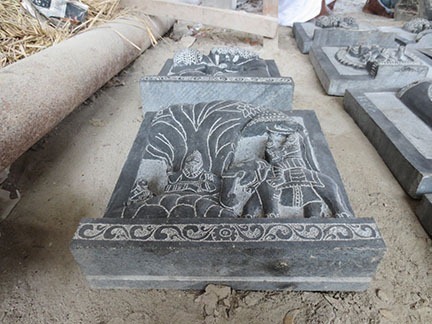 Above here, are the master stone sculptors of Mahabalipuram. To the far left is Sri Balakrishnan, the superintendent (or Sthapati) of Mahabalipuram. 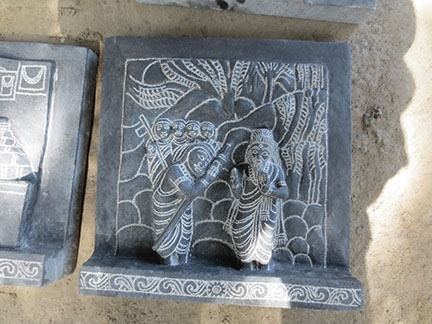 He is explaining the progress of the stone work with Raman and Sangeeta. 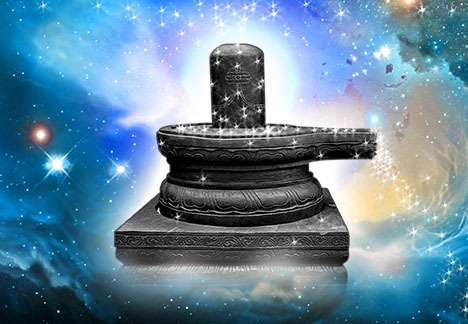 Nandi is in the very beginning stages of development and will be coming soon. . . 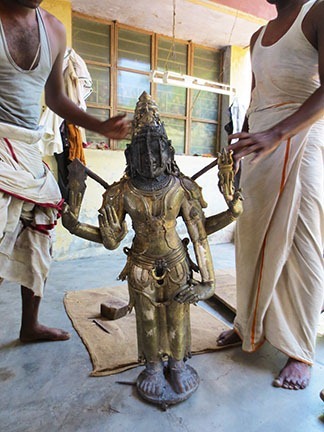 Above, is Swamimalai, the place where the bronze deities are created. 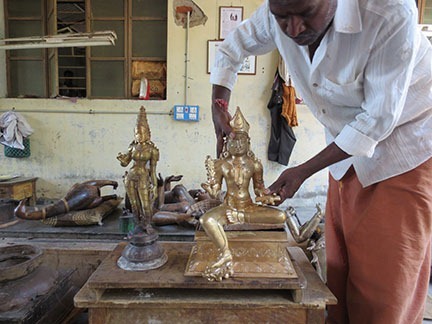 They are created using the “lost wax method.” The sculptor first sculpts a wax image of the deity. 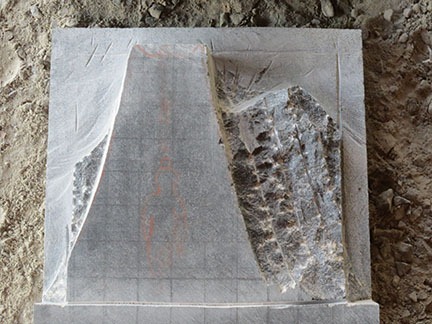 The wax is then covered in “mud,” a substance somewhat like plaster. The mud hardens around the wax. 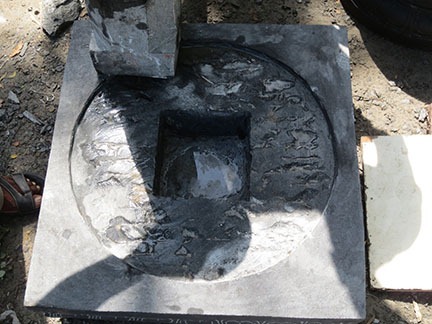 Once the mud is ready, the molten metal, bronze in our case, is poured into the hardened mud melting and displacing the wax. 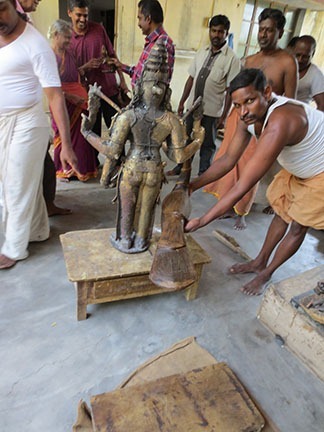 Once the bronze has cooled, the mud is removed exposing the bronze deity. 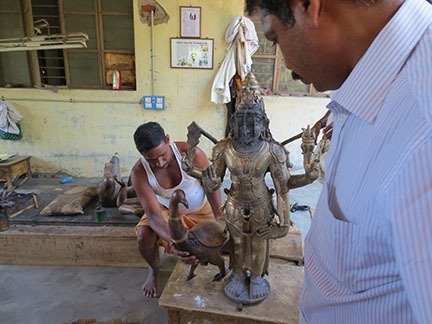 The sculptor then uses a hot implement to refine the details of the bronze deity. 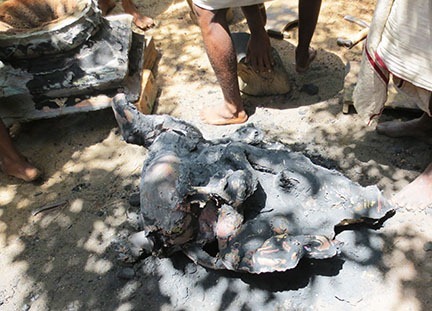 Above, Ganesha is barely identifiable underneath the mud. 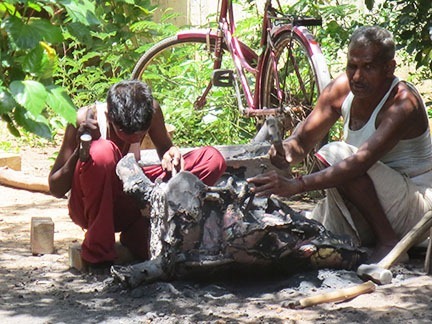 Below, sculptors carefully remove the mud to reveal Ganesha. 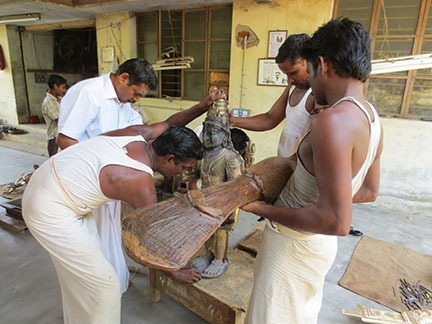 Sculptors working with Ganesha’s pedestal. 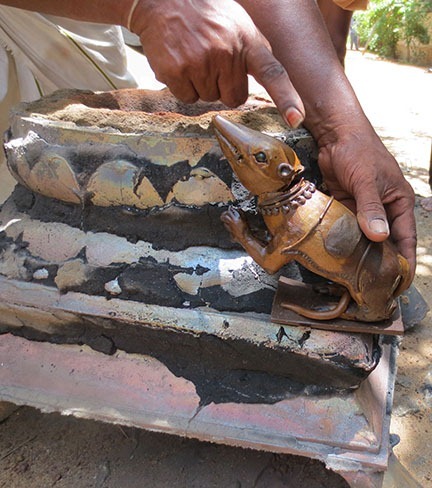 Above, Ganesha’s mount, the mouse, is shown. The mouse is wax at this point ready for the mud covering. Ganesha’s pedestal is bronze and still has some mud on it; the bronze is showing through. 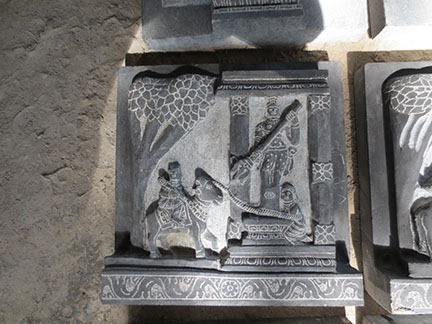 Above, the artist shows us Chitragupta and Parvati. They are both in bronze ready for the fine details to be added. The back of the same deities. 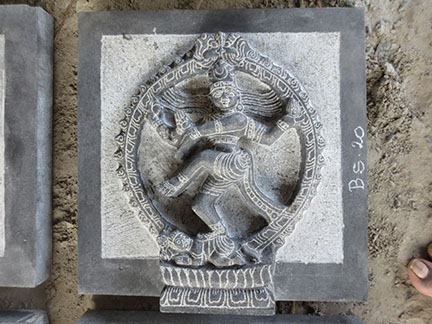 Above, the sculptor shows us Subramania’s mount, the peacock. The peacock is in wax now and ready for mudding. Here, the artist positions the wax peacock in its proper place. 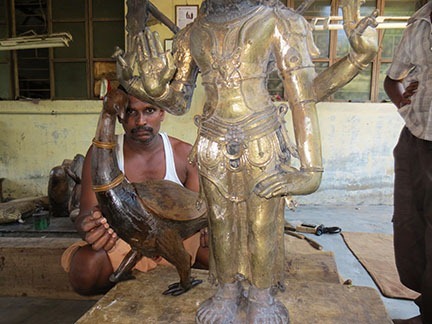 A closer look at Subramania shows that He is ready for the artist to perform fine “chipping” to bring out the details in the bronze. 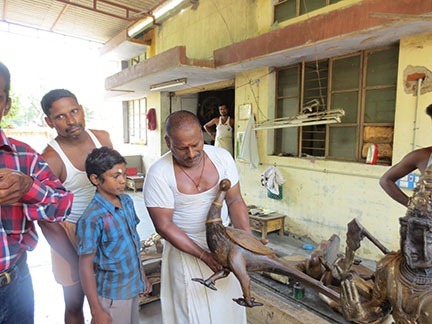 Here, again, artists working with Subramania and His mount, the peacock. 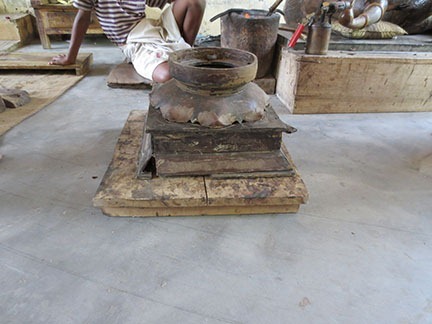 Here, the initial sculpting of the wax pedestal for Subramania is shown. 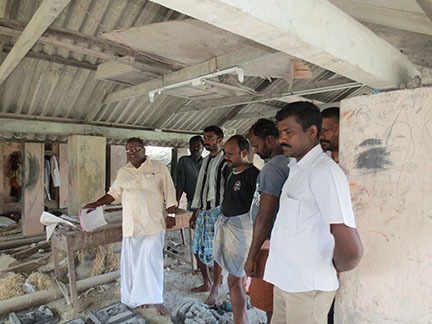 Above, from left to right: Sri Kamaraj (Artisan); name unknown (Artisan); Sri Elangovan (Superintendent or Sthapati of Swamimalai); Sri V. Ganeshan. 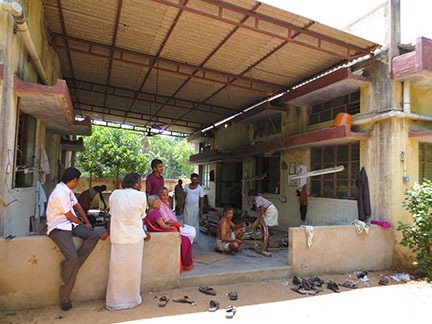 (Manager, Poompuhar, Madurai), Poompuhar is the contractor for this project. 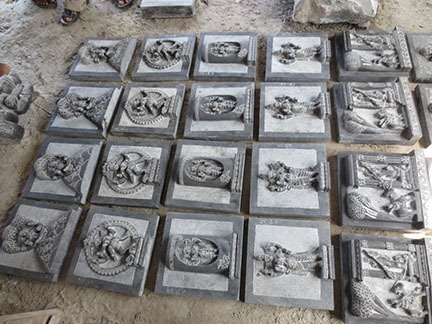 As more donations arrive from devotees, we will begin Phase II of the Mandir. 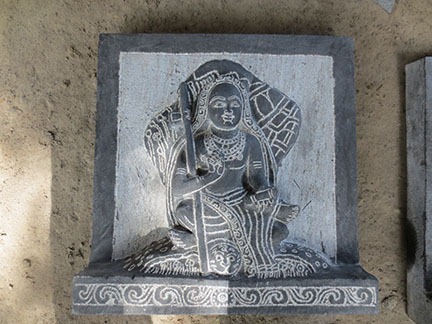 Phase III will consist of adhering tiles, including the stone tiles show above, to the walls and the pillars, creating the arched embellishments in the ceiling, and creating stone altars for the deities. Estimated projected cost for this phase is between $40,000-$50,000.